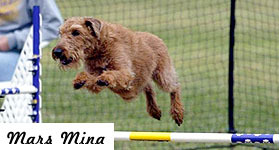 We are dedicated to the preservation of the true Irish Terrier. We breed for sound minds and bodies. We continuously strive for perfection. 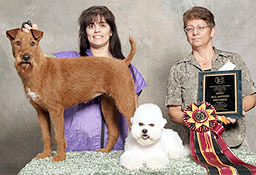 Our magnificent home-raised, top quality puppies are from champion bloodlines. Puppies are available to responsible forever homes. Inquiries welcome. We plan an occasional litter for qualified, carefully screened buyers desiring a loving companion above all, as well as a puppy with potential show prospects. Mars Kaleigh Cassidy cgc, najww just completed novice and will be running soon in open. We expect her to do very well! 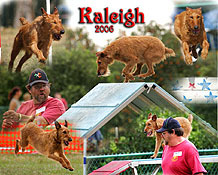 Mars Mina Helminski AX MXJ AD NAC NGC S-OJC TN-E finished 2005 as the #3 Irish Terrier in the U.S. in AKC agility! Keep your eyes on Mars Neitzsche Helminski in 2009! Nora and Emma Rothschild, Japan's next Top Models. Japan's Harper's Bazaar, October 2007. For reservations and inquiries, contact Stephanie Mars. Grooming Charts Please sign my guestbook!